Winters in Kansas City are some of the harshest in the country. From frigid wind and occasional ice storms to snowpack that just won’t melt, we get hit pretty hard by wintry weather in Riverside and beyond. As a result, us humans have to result to using sometimes dangerous items and products to clear the snow and ice away from driveways and sidewalks, to keep our homes and cars warm, and to keep unwanted pests from seeking shelter in our homes. Unfortunately, all of these things and more pose a threat to our dogs’ safety. Here at Eagle Animal Hospital and Pet Resort, your dog’s health, wellness, and happiness are of the utmost importance to us. 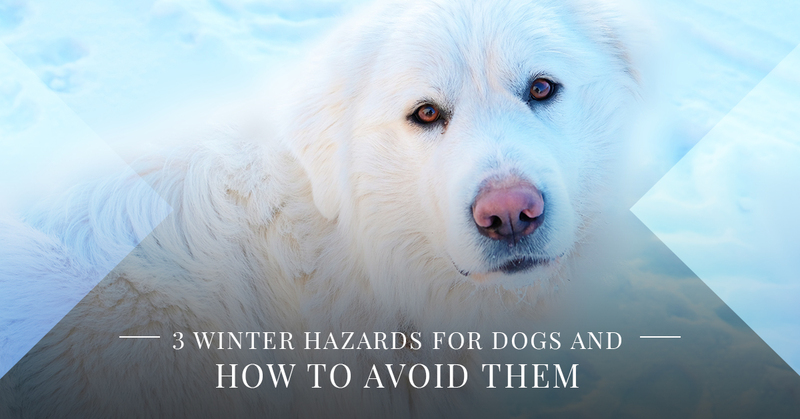 That’s why today, we’ll share three winter hazards that you should be aware of to keep your precious furry friend healthy and safe. If you have any questions or would like to learn more about our dog boarding options, give us a call or reach out to us online. Antifreeze is an essential car fluid that protects the components of a vehicle from freezing. It is also one of the deadliest hazards for dogs and pets alike. Antifreeze comes in bright colors and contains ingredients that smell and taste sweet, which is enticing to dogs. It can cause skin irritations if your dog comes into contact with it. When ingested, it can cause permanent damage to your dog’s kidneys and may be fatal. Bring them into our animal hospital immediately if you suspect your dog has been exposed to antifreeze. Safety Tip: This fluid is one of the most common fluids to leak from a car, and when spilled, can leave a trail of danger for any pet. Be mindful when storing and refilling antifreeze. If you spill it, cover it and clean it up immediately. Cover it with kitty litter to mask the odor, which can keep your dog away from it until you can carefully clean it up. If you notice a leak, have it repaired. This can keep your dog, as well as other pets in the neighborhood safe. Ice melts typically contain potent sodium salts that melt away ice from surfaces like driveways, patios, streets, and sidewalks. These can also harm your dog’s paw pads, skin, or mouth when they come into contact with it. If it becomes lodged in-between their toes or tucked into their fur against their skin, it can cause irritation like redness, pain, cracking, sores, and inflammation that leads to licking. If they get the salt in their mouth, it can be ingested, which can cause a toxic reaction in the form of an upset stomach, vomiting, shaking, and other severe reactions. If you believe your pet is having a reaction to ice melt, call our animal hospital or use our intuitive Virtual Vet tool to talk to a vet online. Safety Tip: Opt for the “pet-friendly” ice melt brands that can be less harsh on your dog’s paws. Keep in mind that these can still be dangerous when consumed. When used around the exterior of your home, sweep up any remnants of leftover salt after the snow and ice have melted. Be mindful of ice melt when walking your dog. Avoid areas where you can see ice melt, especially thick piles. Consider covering your dog’s paws with dog booties when going on walks for an added level of protection. Ice is troublesome for humans and dogs alike. The worst part is, you can’t always see it when it’s there. While dogs’ paws are resilient and built to protect the softer parts of their hands and feet, ice can still injure their paws. Sometimes, their warm feet can stick to ice, causing patches of skin on the paw pad to tear away when it really sticks. Additionally, ice can form in thick patches on surfaces where they walk, which can cut the skin on the top of their foot or in-between their toes. Ice and slick surfaces from sleet or a dusting of snow can cause your dog to slip-and-slide when running or walking at a quick pace. While dogs have excellent balance, one awkward slip can cause a soft tissue injury in the elbows, shoulders, knees, and ankles. If it’s serious enough, such as a tear, it could require surgery to fix. Safety Tip: Be mindful of ice and other slick surfaces for both you and your dog. Pay attention to the ground when walking them, and try to avoid snowy night time walks when visibility is reduced. Clear away snow from areas where your dog frequents as it’s falling before it has time to pack and harden. Again, you might consider dog booties to give them extra traction when walking on icy surfaces. If you have to travel this winter and can’t take your dog with you, we have a safe and fun solution: dog boarding! Our animal hospital and pet resort offer a safe, comfortable, welcoming place for your dog to stay when they can’t travel with you. We offer a selection of studio, deluxe, and luxury suites where your dog can’t rest in warmth and comfort. Plus, our state-of-the-art dog boarding facility features safe play areas and dog runs where your pup can play, mingle with other dogs and people, and have an all-around great time during their stay with us. Don’t search “dog boarding near me,” when Eagle Animal Hospital and Pet Resort is just a call or click away! Book your dog’s stay today!